Last fall 8 Limbs yoga teacher Jenny Hayo introduced me to “Insights at the Edge,” podcasts posted by Sounds True founder Tami Simon that interview visionary poets, teachers, artists, speakers, business owners (et al!) on their current edge and contribution to the world on the level of consciousness raising. I have tuned in as often as possible, often during runs in the Arboretum or walking up the hill to work. I have found this solitary physical activity while listening on earbuds to amazing information quite transformational. The podcasts are free and I want everyone to know about them! My favorites have been Richard Freeman’s Living Yoga, Tara Brach’s Radical Acceptance, Ken Wilber’s Integral Transformation, David Whyte’s Being at the Frontier of Your Identity, and Peter Levine’s Healing Trauma. But I have honestly barely scratched the surface myself. Most all that I have even tried have been amazing. Tune in, let me know what YOU enjoy hearing about at annephyfe@8limbsyoga.com. You can get them through the Sounds True website or iTunes. Sounds True’s slogan, “many voices, one journey” is by divine accident very similar to our new slogan at 8 Limbs: “many paths, follow yours.” We are both committed to sharing their diverse wealth of information that is available to assist practitioners in their practice. And we are both businesses that strive to succeed at what Sounds True contributor Patricia Aburdene calls Conscious Capitalism. We believe that putting those words together is not only possible, but essential for the sustainability of our economy, our planet, and our own lifeforce. Thank you for being part of this conscious capitalism experiment. We will continue to do our best to be a wonderful place for you to practice yoga, and for our staff, a wonderful place to work. 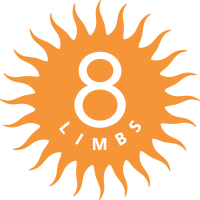 We value your support and your presence at 8 Limbs. Namaste.